Redco™ Sprockets were developed to increase the life of your equipment and decrease the noise in your facility. 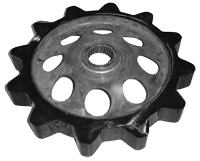 There are three standard types of sprockets available (below) but many custom sizes and configurations have been developed to suite a variety of applications. Our newest design with all the benefits of our Redco 750 sprocket but no bolts are required for installation. Redco™ 750 bolt together idler sprockets are a quick and easy fix to sprocket replacement frustrations, particularly in the middle of a shaft. Increases production and reduces noise and wear on equipment. Designed for light to medium duty applications. Available for 81X chain (but will work with H-78). Designed for sawmill and planermill use. Reduces chain wear and noise. 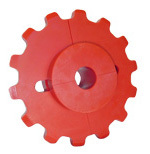 Elastomeric characteristics make these the best plastic sprockets for industrial use. Interchangeable with standard steel sprockets. Requires no bushing or bearing. Redco Drive Sprockets incorporates a cast iron hub for strength in combination with Redco 750 A Plate. Designed for light to medium duty applications it will perform well in areas such as transfers and most planer applications. Makes use of the same A-Plates and the Redco Idler units. You only need to replace the A-Plate when the need arises.